Most of us use the word “should” A LOT. 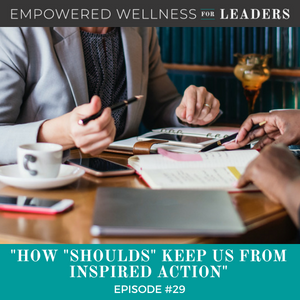 On this episode, we take a look at the detrimental effects of telling ourselves we should do something and what happens when we push ourselves to those things. I also explain how to begin learning to trust what’s best for you and in line with what you want to do with your life. Listen in to find out how you can stop making your life decisions with an assumption that someone else is the expert of your life, shift yourself into a more powerful mindset that serves you, and start taking meaningful, inspired action today. And make sure to download a guide that I created for you just for this episode, to help you stop “shoulding” all over yourself and start taking inspired action. The detrimental effects of using “should” as a part of your vernacular. What happens when we push ourselves to do something that we think we should do. How you can learn to trust what’s best for you. The process I use to analyze the things I want in my life. An exercise to help you stop your people pleasing and perfectionism and start taking inspired action. Download the free guide to help you stop “shoulding” all over yourself and start taking inspired action. How are you, listeners? Good morning and I hope you’re doing great on this Monday morning, and I hope you’re enjoying the final days of summer wherever you may be. Thanks so much for hanging with me. I have a quick podcast for you this morning on something that I’ve been noticing recently not only in my coaching conversations but out and about with my friends, as well as in my own head. We all say should a lot. Do you? It goes like this: you should eat vegetables, you should workout three or four days a week, you should call your mother, you should do keto, you should eat oat bran, you should always drink a lot of water. Then, you should spend a lot of time with your family, you should be the top producer, you should work really hard, you should take a vacation, you should save money, you should. We are should-ing ourselves to death. Although there are some great choices and ideas that come in our should sentences, and they do give us some information, we’re causing ourselves unnecessary harm and usually creating a standstill in our efforts around anything that we think we should do. And more important than that, we’re handing over our authority, our power when we’re totally focused on someone else’s opinion on what we should do, and then not regarding any of our own wisdom, insight, or experience. That’s what we’re doing when we listen to should. We are making decisions around our lives with an assumption that someone else is the expert of our own life. And I want to remind you, you are the expert of your own life. I am the expert of my own life. And in this episode, I’m going to show you how to take your power back when you notice you’re should-ing yourself in your life. Alright, so think about it for a minute. How do you feel physically when you say, when I say, you should or I should? Somewhere in our mind, we think it must be helpful because we do it all the time. But what if it isn’t? I know I feel immediate resistance, and like I did something wrong when someone else says you should. I interpret it to mean I’m doing it wrong and so I should do it another way. Or it’s just another thing I need to add to my life. And what’s so sad is when someone else is sharing something that might actually be helpful, I know I stop listening at the should part of the sentence. I might be missing some great feedback. Don’t you stop at that point? I know I do. Even when we’re conversing with ourselves, I wonder if I just stop listening after the should. I really do also think that should conversations really begin sounding like the audio in the Charlie Brown movies. And so you know, whenever we hear, you should be eating something or you – anything around that, I think we immediately tune out. So some of this may have come from our upbringing, but what is it about the use of this word that makes me feel like my mom is using my middle name and asking me to do something miserable around the house? I really don’t think it’s all that important to understand why we do this to shift into a more powerful mindset or space. Because if should makes us feel criticized and makes us resist what is the key to turning this around? I don’t know, I almost recorded this podcast last week and I’m so glad I didn’t because as I thought about this more, you know, I was going to do this podcast all around food and all these things, the shoulds that come in our lives and I’ve done a lot of work in my podcast around that where classic diet information is really not helpful but tuning into our own appetite and what is fuel for us really is. And so you can dig into those episodes for that kind of should thinking. You know, if you’re having any shoulds around food really lean in and get more intuitive about eating. Go to those podcasts, 10 and 13 are my classic ones for that. But I’m going to go deeper with you today. When we are pushing ourselves to do things that we think we should do, I think it’s a sign that we’re worried about what others think. I think it’s a sign that we’re not trusting our own wisdom, and we’re not also recognizing our own unique path. And that’s really sad. And I do think there’s another way of learning to trust what’s best for you, what’s in line with what you want to do with your life. So how do we do it? Okay, so first, I want you to notice any should conversations that you hear a lot, that they keep coming up. And as I go through, I’m going to give you an example of mine, but I want you to play along, and I want you to just notice where are your should conversations. Okay, so mine are, “I should drink less wine, I should workout more, and I should be doing more Facebook lives for my business.” Alright, so I’m using my example, but make sure even – if you’re in a place to pause it and just think, what are the shoulds that come up for you when we’re talking about this? And you will feel better if you just write them down, I promise. Alright, so then what do you want to do around these issues? What do you want? Alright, I’m going to work on the I should drink wine first. What do I want to do about the wine? When I thought about it, it was really clear and specific. I never want to drink wine on an empty stomach, it makes me feel horrible. I want to choose really good wine with certain meals, and really enjoy it. I’m committed to not drinking white or rose because they just give me a headache right now. And every time before I drink alcohol at all, I don’t want to assume that I have to drink because everybody else is. I want to just take a pause and go; do I really want this? That’s pretty specific. And that came up really quickly for me. I think this could work. Okay, now let’s do a work example. Choose one for you as I share my illustration. I’m going to use I should be doing more Facebook lives in my business. I should be doing more Facebook lives. That doesn’t make me feel good, and I don’t really do anything about it. In fact, I stopped doing them. Isn’t that fascinating? So I’m going to unfriend anybody that I’ve never met. But first, I’m going to invite them to my business page. I’m going to create a new boundary between my personal page and my business page. I’m going to play and have a lot of fun on my personal page, but I’m not going to be afraid of who I’m posting that for. I’m going to do that with all my friends and people I really care about. And then I’m going to use my business page for that purpose. So isn’t that interesting? I created a boundary there. I didn’t even know I needed one. What also came up for me is I’m going to create a new video training for my DM Coaching followers. I did one when I launched my podcast and I don’t really love it. It’s good but I don’t really love it. I was very new at doing videos and I want to do something new. Wow, I really had no idea those were my ideas or my wants. What do you want to do about the should that’s coming up for you? My mind is truly blown today. This was like – I was just going to create a worksheet for you and I thought that was a good way to go about it, I’m great at coming up with good coaching questions, but it’s just fascinating how clear – how much clarity I got. And it gave me so much inspiration. I can’t wait to take action and follow through with all that. No more resistance about Facebook and no more resistance about wine. I actually think I’ve been drinking more wine because I didn’t really get honest about what I wanted to do about it. So there will be a guide to this exercise in the show notes. So that’s dianamurphycoaching.com/29. But I have something more for you. This has been really big for me. I have another exercise for your people pleasers out there, just raise your hand along with me. Are you a people pleaser? Have you like me, spent a lot of your life and a lot of your energy even right now, behaving and performing so that you’d be seen as a good person, a good student, a successful business owner, a great wife, a great mom? Any of those things. Oh, people, it’s just wearing me out. I’m doing less and less of it and this exercise actually helped me to tune in some really bigger issues for me. My coach caught on to what a people pleaser perfectionist I am, and she’s really good, but folks, you don’t have to know me very long to not miss that I’m a people pleaser and a perfectionist and like that high achiever, always looking for that buzz I get. I get a high out of like, ooh, I did that, and somebody noticed. You know, it’s just crazy. Well, she asked me to do something that was not as difficult as I thought, but it was really inspiring. She asked me to make a list. If I was shameless, if shame just wasn’t possible, if I was one of those people that just didn’t care what others thought, what would I do? You know what started happening for me since I asked that question? I wore a bikini yesterday even though I’ve gained a few pounds this spring. And you know what? I was over exaggerating the weight gain. The bikini did fit and I was like, come on. It’s just so self-focused. I had a good time being out in the sun yesterday. You know, I made that Facebook decision to clean up my Facebook feed and really get real about some boundaries I wanted to make. In my office, I threw out all these old notes and I have a pile of them waiting for me at home. I am just going to shred them. I haven’t touched them for a while and they’re just not important, and it cleans up my headspace. But I was worried I was going to miss something and worried that there’s an old training in there, an old note from a coach, and I was like, I just – I’m going to throw them all out. You know, I also – when I asked if I was shameless, what would I do, and I joined a VIP mastermind group with a great coach. Her name is Stacey Smith and she also has a podcast. I just am loving this group, and I’m letting it all hang out with them, with my tribe. And I’m a hider. I love doing brave, bold things like creating a podcast and then I hide in other areas and I am just going all in with that group. And it’s making a big difference for me. Another thing I did is I handed over the reins of a book club. I founded it 10 years ago and it was just time. I was starting to resent the work around it, I was starting to – it was just getting weird. And I just decided to hand it over, and you know what? It’s doing better because I did. These women are doing more social events together, they’re traveling together, and they’re starting to really engage in some cool books this fall. It’s doing better because I let go. Also, I put in an Alaskan wilderness trip on my vision board. Think Huskies and sleds. Oh my god, it’s scaring me as I even do that. Not just the investment financially, but oh my god, I’m like, I’m really going to do this. I also set a big scary goal in terms of what I’m offering in DM Coaching this year. And I’ve seen where I was hiding and I’m taking care of that. I’m really asking the question, where am I hiding more? I’m playing more, I’m cooking more, I’ve stopped complaining, and I’ve stopped worrying about my business because I’m shameless. What about you? What would you be doing if you were shameless? If shame was impossible? Remember to notice and honor should phrases. Even take some time to journal. I do this on raw scratch pieces of paper. It’s really a version of the thought download but I would love you to write down today after this podcast or sometime this week, write down every should that comes to mind. I should, around everything around your life. And those that are really getting your attention, highlight maybe three of them and then ask, what do you want to do? Prepare to be inspired. It just gave me so much energy and clarity. I know that that’ll happen for you. I know you have the wise and inspired answers right there. Oh, this podcast was so much fun and I can’t wait to – I am just planning the rest of the summer, the rest of August, and I have some beautiful free trainings coming up. And if you want to be more part of DM Coaching, just get on my homepage, sign up for my videos, or just send me an email and I’ll put you on my list. Diana@dianamurphycoaching.com. Every week I mention the podcast and why I wrote it and give you some more insight there, but even more than that, I’m writing a letter every Friday to you, just of a little something that I’m learning. So if you’re enjoying these podcasts, just join me there. Thanks so much for listening, have a great and empowered week.